I have always been a DIY enthusiast through-and-through. Usually, I see something and I think, “I can probably do that.” It’s part of my inherent creative nature, but it’s also part of my keenness to learn. It was no different when I first came across handmade bath and body products. These were cute little soaps and bath bombs sold by small vendors at craft fairs. They smelled better and looked better than anything I had ever bought at a regular drugstore. I hadn’t ever thought about how soap was made or considered that it was something I would be able to do myself. This new found interest soon turned into a slight obsession as I dove headlong into the world of handmade soaps. For months I talked about soap. Sharing random soapy facts with friends and family, checking out the soap section in every store I visited and absorbing all the information I could find about how soap was made. Finally, I decided to go ahead and give soap making a try for myself and found it to be pretty fun. 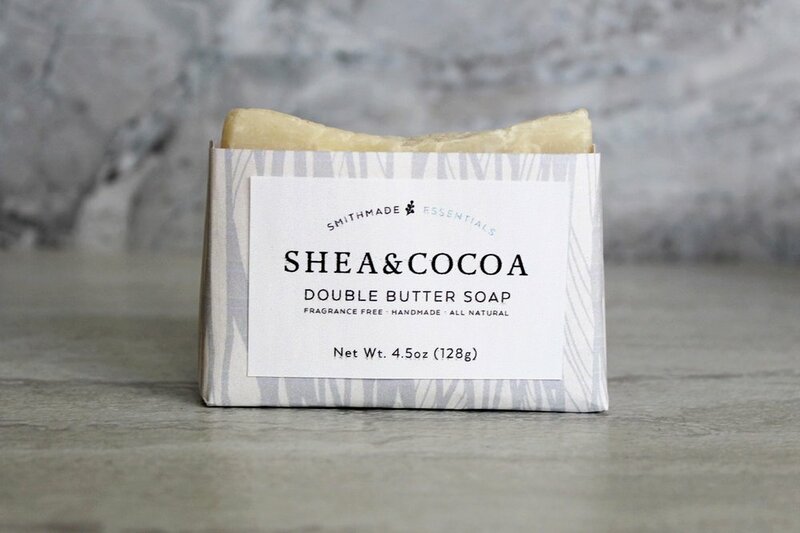 Very soon after soap making became a hobby I started exploring turning it into a new business venture and the idea for Smithmade Essentials began to bud. The thing about being a brand designer is that I get to create beautiful designs for other people’s products. After a while, it’s easy to want a product of your own. I love running KSC which is a service based business. I work directly with other business owners who often provide B2B services. Product based businesses are usually B2C. Operating a product based business presented a whole new challenge for me which I found intriguing. The moment I decided I wanted to sell my soap I started strategizing. I did all my usual brand research and development and quickly came up with my brand positioning which was to create fun and fragrant soaps with quality ingredients. Creating the supporting brand assets proved to be more difficult than I anticipated. It felt like the sky was the limit as to what my brand and packaging could look like. I went through concept after concept and found it really hard to choose one. I thought I knew what general style I wanted, but as I got into designing I realized that there were a lot of options I liked. Here are a few of the packaging variations I played around with while also trying to decide on product names and my logo design. After designing so many different packages (even more than pictured here) I realized that I needed to step back and think practically about my design approach. I came up with some guidelines to help me make my decisions. 1. The packaging needed to be inexpensive. I calculated my cost of producing each bar of soap and researched what price the market could bear for artisan soap. 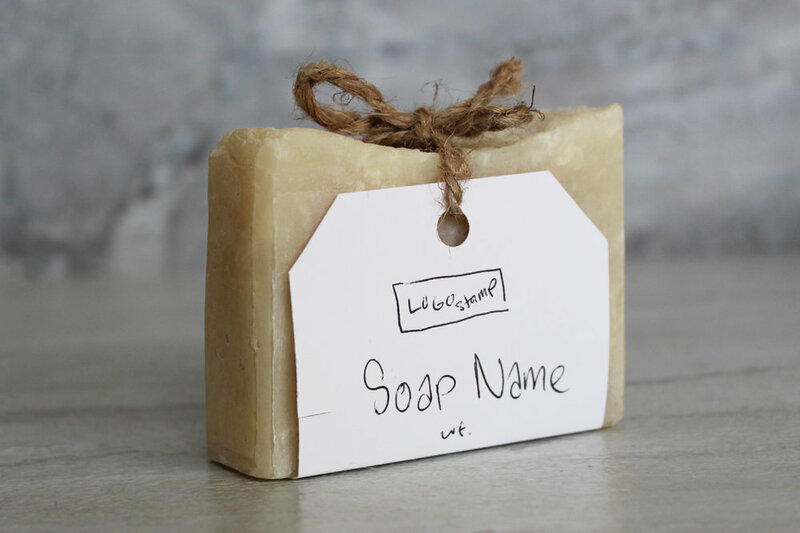 Though the retail price of artisan soap can vary quite a bit, I decided to keep my brand positioning in mind and my future business growth goals. I chose a retail price that was realistic for me as a new business and would give me wiggle room if, say, the price of olive oil suddenly increased by 30%. With my retail price set and my cost per bar known, I was now was able to create a budget for all my business expenses with packaging being part of that. 2. A large part of my interest in making handmade soap is being able to control the design. 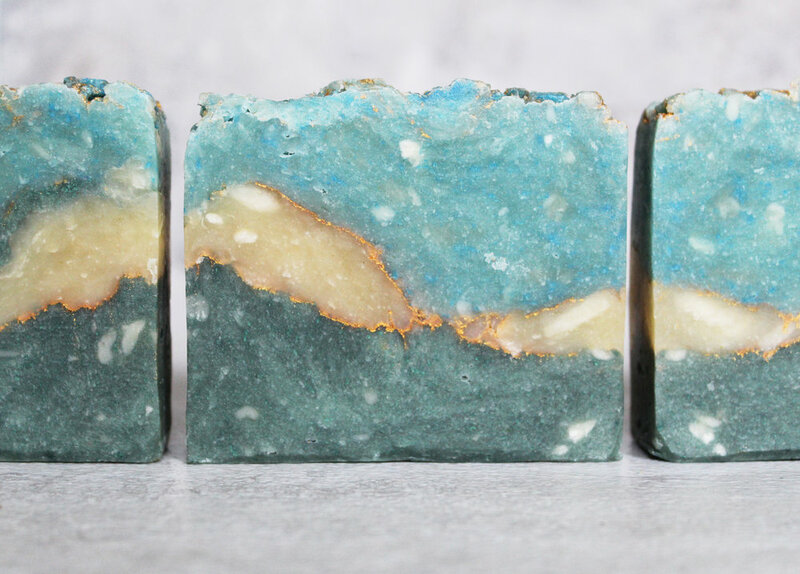 My soaps are colorful with lines of gold mica, swirls, and layers. My early package designs had the soap completely encased in the package. I realized this was a mistake. I wanted people to choose their soap based on the design and the fragrance. My packaging needed to allow my soap to be seen and smelled. 3. Cigar bands are a very popular packaging choice for handmade soap. They are simple, allow the soap to be seen and are easy to apply. One problem I noticed with them while browsing for soap at local shops was that the bands come off. Over time, soap will lose water weight causing the bars to shrink a bit. A cigar band that may have been tight at the time the soap was packaged may loosen. As customers pick up soap to smell it, the cigar band can easily come off during this handling. I saw baskets of beautiful soap all mixed up with their bands strewn beneath them. There was no clear way to tell which soap was what and this was a big no, no for me. I needed packaging that could endure handling, soap shrinkage and look good no matter where a potential retailer might stock the soap in their shop. 4. I wanted to have the ability to completely create the packaging myself. If push comes to shove and a printer isn’t able to deliver labels in time or I miscount and end up short a few labels, I wanted to have the ability to print my own packaging. This also gave me some security if I decided to change my mind about the design or some wording on the packaging. Starting a soap business was so new to me that I still felt uncertain and definitely still indecisive about a lot of things. Knowing that I could make changes without too much extra cost gave me some peace of mind. 5. This last requirement goes along with #4. The packaging needed to simple enough for me to do 100 times without it taking all day. I wanted to keep this business small for a while as I learned the ins and outs of running a product-driven business. I also wanted to keep expenses low. This meant that I would be doing 100% of the labor involved in all parts of getting my soap business up and running. My time needed to be balanced between the soap business, my obligations to my clients here at KSC and the non-business happenings in my life. With these requirements guiding my decisions, I began eliminating design concepts. Soon I had one design that suited all the parameters. After some tweaks and refinement, it was done! This past December, Smithmade Essentials officially launched. I appeared at a holiday craft fair and nearly sold out of all my soaps! At the start of the fair, one customer asked which soap was a bestseller. I replied saying that none of them were as it was my first time selling at a market. “Could’ve fooled me,” she said. I was ecstatic! The Smithmade logo and package design were the most important brand assets that I needed to launch my business. They truly established the look and feel of my soap brand and I attribute my success at my first market appearance with the strength of my brand design. This past year has been quite the journey. Creating this new business and brand has been exciting. The amount of support from friends, family and the wonderful locals here in CT has been amazing. In 2019 I hope to grow my little soap shop and expand my product line. What’s your startup story? I’d love to hear it. Fun & Fragrant Artisan Handmade Soaps!